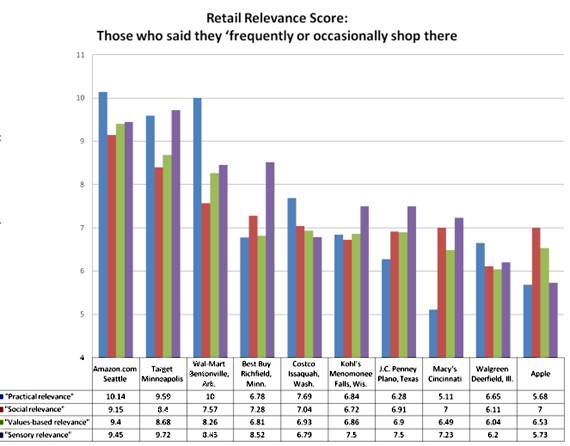 Amazon.com has been named as being the most “relevant” retailer in the US. In a study of the 21 top retailers in the US, just over 2000 shoppers were asked a variety of questions designed to rate the retailers as being the ‘most’ or ‘least’ personally relevant in four areas. Practicality, values, sensory appeal and social appeal. According the to study’s authors, Brodeur Partners, Amazon came out on top in three categories, and placed second in the other. One of the categories that Amazon won was the ‘practical’ category. They found the result “striking,” noting that “there’s no real-world storefront shoppers can visit.” Practicality was defined in the study as being the most dependable retailer with the best value. WalMart came in second place in the practicality rating. Amazon also came out on top when rated on ‘values’. Values were defined to the study’s participants as being “the retailer that you most admire and most reflects your personal values.” Target came in second place in the values ratings. As for ‘sensory appeal’, defined as “the retailer that you find the most interesting and appeals to your senses,” Target won out, with Amazon coming in second. And for ‘social appeal’, defined as “the retailer you are most proud to be associated with and is an experience you’d want to share,” Amazon won, with Target in second place. Combining the ratings, the overall top 10 most relevant were 1) Amazon, 2) Target, 3) WalMart, 4) Best Buy, 5) Costco, 6) Kohl’s, 7) J.C. Penney, 8) Macy’s, 9) Walgreen, and 10) Apple. It’s interesting to note that Apple, which is currently the largest publically traded company in the world, ranked 10th overall.